​For years I would go to street fairs or food markets and there was always a gozleme stand. It was always the stand with the longest queue. It was always the queue I would stand in, why, because they are delicious and because my daughter would beg me to. You wait and watch as the women roll out gozleme after gozleme, and you tell yourself I need to try and make these, but you never do, as although the women make this look easy, you don't think it will be. And the fillings which should I choose, the spinach and cheese, the spinach, cheese and mushroom, the beef mince one, my goodness the choices. Should I try something new like seafood or sausage or should I stick with the ones I know and love. It really is a long queue, you have loads of time to think about these things. 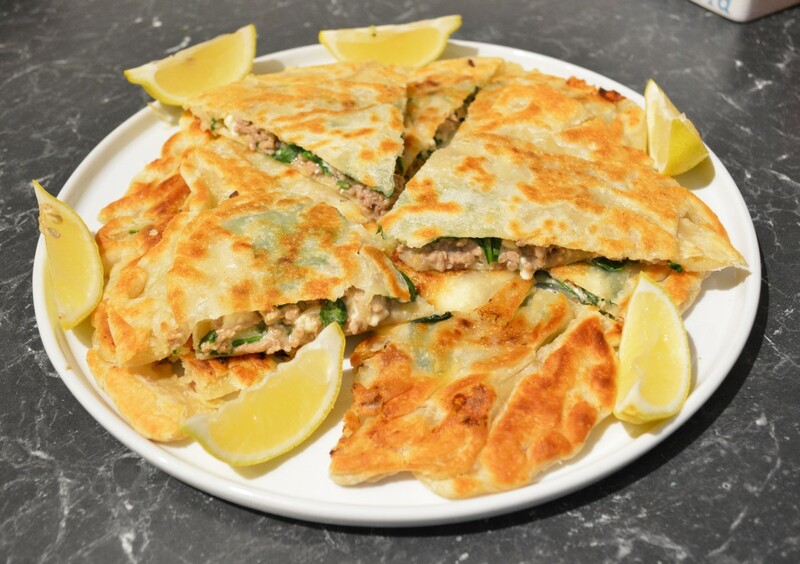 But finally, I decided it was time to give this recipe a go, so here you have it, an easy gozleme recipe that you can now make at home, and it tastes like the stall ones. Yes I said it, it really is that good. Now the dough, this is the scary part, or I thought it was. The dough is super easy to make, especially if you have a free standing cake mixer with a dough hook attachment, it means no hand kneading for you. What I find most important is after the kneading is done, you want the dough soft, but not sticky. I found if it is really sticky, it is hard to roll, and tears easily. So add the flour as per recipe, and if, once kneaded, it feels sticky, add a little more flour. The dough is fairly easy to work with, it doesn't shrink too much when rolling and it doesn't stick to the work surface. If you find it is sticking, your dough is probably too stick, just lightly dust your work surface with flour. 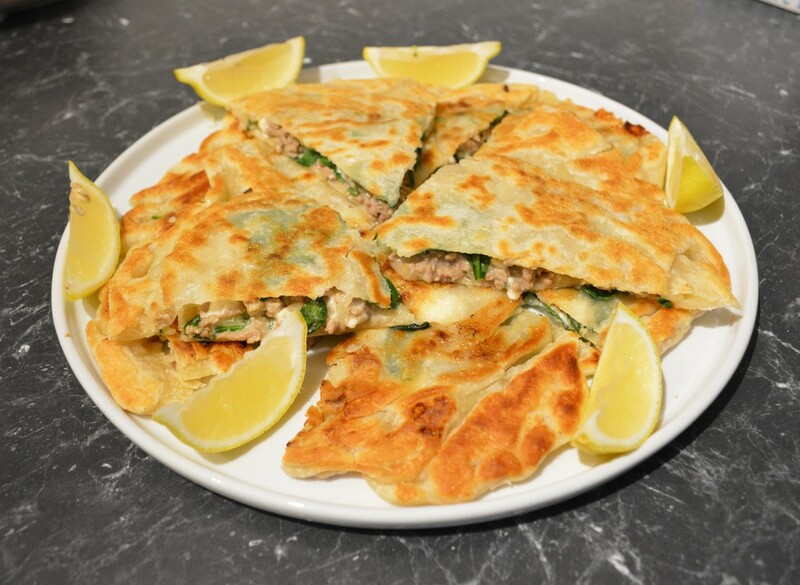 For me the hardest part of this recipe is lifting the prepared gozleme off the bench and getting it into the frying pan. I find you first need to loosen the rolled pastry a little from the bench, it doesn't stick when rolling, so it is easy to do this, lift it up and dust the bench with a little more flour. Place the dough back down, fill and cover. Now the hard part, using both hands carefully lift it and place in the frying pan, by dusting the bench with flour you should be problem free, but if you get it all messy, you can fix it as best you can in the frying pan. With regards to the mince I love a combination of pork and veal, however you can use just beef, or lamb or chicken if you prefer. As for the filling, I have added mushrooms as optional, I love them in this, so add them if you to love mushrooms. You simply have to slice up the mushrooms, pan fry in a little oil until just softened, then place on a plate until needed. Then scatter over the filling. Now the original recipe stated this makes 2 gozleme, I get 3 out of mine and they are large. So how many you make will depend on how big your frying pan is. You also have two ways to make them, you can roll out one round of pastry, top with the filling, then top with another pastry round, seal and fry. Or, you can roll out one dough, place the filling on half of the dough, then flip the other half to enclose the filling, seal then fry. Either way works. Do what you find easier. So here you have it, home made gozleme. When I make this it is gone so quickly, my family love it. If you love gozleme, you no longer need to wait for the next street fair, you don't need to queue up anymore. Give these a try, they won't disappoint. Place the flour and salt in a large bowl of a freestanding electric mixer with a dough hook attachment. Add the olive oil and water. Knead on the lowest speed until it becomes smooth and elastic, it will take about 5 minutes. Feel the dough, if it feels sticky, add a little more flour. Cover the dough with cling film and rest for at least 30 minutes. Meanwhile make the filling: Heat oil in a frying pan, add onion and garlic, saute for 3-4 minutes or until onions begin to soften. Add the mince, break up lumps, season with a little salt (as feta is being used and can be salty) and pepper, to taste. Cook until well browned. You want the mince to be cooked at this stage. Cool for 10 minutes. Add the feta cheese and spinach to the mince and mix well to combine. Divide the dough into 6 even portions (remember you are rolling the pastry out only as large as your frying pan). Shape the portions into balls, roll out one ball of pastry as thinly as you can get it, then roll out another and try to get the second round slightly larger than the first. The round you will use as your base, lift it up carefully and dust the bench with a little more flour, this will help when you need to pick up your gozleme, place the dough back down, restretch with your hands if needed. Top the base round with 1/3 of the mince and cheese mixture, leaving a 1-2cm border. If you are using mushrooms, scatter them over the filling now. Carefully place the other rolled pastry round on top of the filling, seal the edges by pressing down with fingers. Repeat with the remaining dough and filling, until you have three gozleme. Heat the frying pan on low-medium heat and add about 1 tablespoon oil. Carefully lift one of the gozleme and place it in the frying pan. Fry the gozleme on one side until golden brown, then flip it over and fry until also golden brown. Slice into wedges and serve hot with lemon wedges.